For air tight stove. Weekly applications of chimney creosote cleaner helps prevent soot and creosote build up in chimneys. Catalytic action reduces accumulated deposits and lets fire burn cleaner. Not a substitute for regular thorough chimney cleaning, but it makes that job easier. 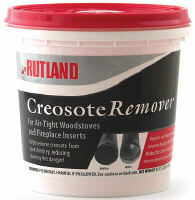 Weekly application helps prevent creosote and soot build up in chimneys. Catalytic action reduces accumulated deposits and lets fire burn cleaner.